D.K. - Mystic Warrior. Vinyl 12. Bleep. You’re not wrong for connecting Parisian producer Dang-Khao Chau with Donkey Kong, the classic hit video game platformer series by Nintendo. 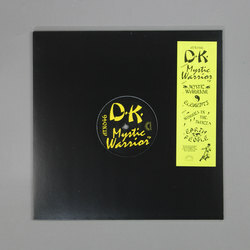 Performing under the name D.K., even Chau isn’t shy about the link on Mystic Warrior. The EP’s unbeatable title track takes luscious ‘fourth world’ instrumentation and splices its DNA with 90s rave music and punchy, 32-bit video game soundtracks. Finally, he breathes life into the wilderness with monkey cries and jaguar growls.